Former Marine and CIA agent Jack Morgan inherits his father’s renowned security and detective business–along with a case load that tests him to the breaking point. Getting to the bottom of an NFL gambling scandal and an unsolved LAPD investigation into 18 school girl slayings would be enough. On top of all that, Morgan takes on solving the horrific murder of his best friend’s wife. As Morgan fights the urge to exact brutal revenge on that killer, he has to navigate a workplace imbroglio that could blow the roof off his elite agency. And it’s an especially explosive situation . . . because the love affair isÂ his own. James Patterson is an interesting writer to me. I have loved almost every book I’ve read that he has written and I love the combination of short, cliff-hanger chapters and strong writing that makes his novels so easy to read! 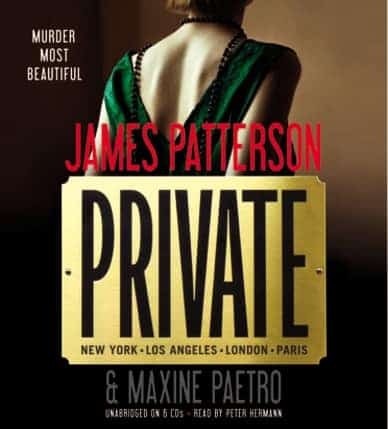 I was really happy to have the chance to read his latest novel,Â Private, because there are new characters in this novel, a new premise and I think it will be the start of a new series of books. I also thought it would make a great book to take to the gym because I can read and workout and pick it up again the next day when I go (it is definitely an incentive to go and work out)! That being said, I knew I had high expectations ofÂ Private and I hoped that the book would meet my expectations!Â Private is the story of Jack, and his crew. Jack runs a substantial world-wide private investigation firm. He has a lot of issues in his past and continues to face difficulties in dealing with his twin brother who exemplifies the negative traits held by Jack’s late father. Jack and the members of his firm deal with their personal lives as well as grappling with some complex mysteries. The firm tries to deal with a murder case (involving the wife of Jack’s friend), a serial killing spree that has spanned years and an NFL bet fix scandal. I enjoyed this novel for the most part. I liked the variety of the stories and how they were woven together. I also liked the backstory about Jack and his father that brought another dimension to the book. The only thing I did not like was the fact that the book seemed to be trying to bring in a bit of multiple genres as a means of interesting different readers – the bits that touched on romance (with a little sexual innuendo) didn’t seem to work in this novel, nor did the story involving Jack’s “evil” twin brother. I think the book could have been edited a bit and would have been just as good (if not better)! I would read more books in this series as I love Patterson’s style of writing and the short chapters with cliffhangers that drives the plot. I’m just hoping he does edit a bit when writing the next books in this series. I would love to give this as a gift to my mother, she would love it. I love reading James Patterson. It sounds like a great audiobook.